Perhaps the biggest attraction in the Columbian capital Bogota is called the National Capitol. The building is one of the most important in Columbia. It houses the state government - Columbian Congress. The beautiful building is located on the popular square Bolívar, located in the heart of the more than seven million Columbian capital. Architect of the National Capitol in Bogotá was Thomas Reed. The construction of the magnificent building started back in 1876 on the orders of President Tomás Cipriano de Mosquera. Overall completion of the building hapened fifty years later - only in 1926. National Capitol Hill is known for its memorable mural, located in the Hall for notifications (Elliptic chamber). This masterpiece was created by artist Santiago Martínez Delgado, under the leadership of Alberto Lleras Camargo and Laureano Gómez. Both subsequently became presidents of Columbia. Today, the mural is considered one of the most significant in the history of the South American country. The painting of the walls began in 1947. The occasion then was a major conference of South American countries, held in the National Capitol. The picture captures the moment in which the historically significant personalities Bolivar and Santander Cucuta are leaving the Congress, held at a time in which actions are carried out, that led to the creation of the state Columbia. Simón Bolívar, after whom is actually named a square in Bogota as well, is a Latin American revolutionary and politician, deeply respected in South American countries, since he dedicated his life to gaining their independence. It is him, that the state of Bolivia is actually named after. Another interesting fact is that in Venezuela every major city has a square named after him - Bolivar. In his honor was also erected magnificent monument of Bolivar Square in Bogota. Close to the National Capitol are other important buildings of strategic importance for the management of the Columbian capital, which attract huge tourist interest. 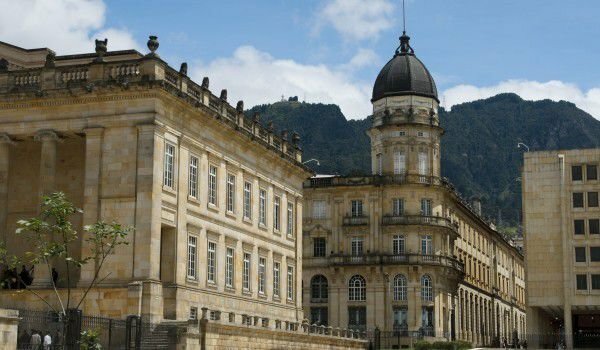 On the square Bolivar are still Hall, Palace of Justice, the main cathedral of Colombia and the presidential palace Nariño Palace.